Buckeye Valley’s Chloe Dawson competes in Saturday’s OHSAA State Cross Country Championships in Hebron. 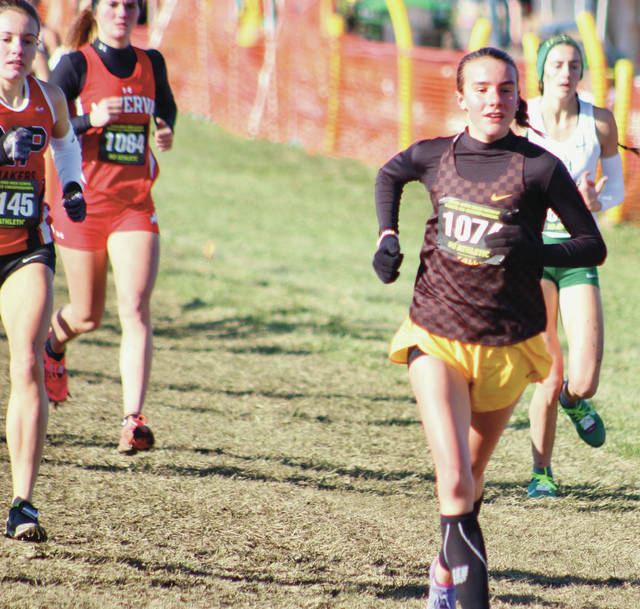 Olentangy Liberty’s Gracie Sprankle finished sixth overall in the Division I race and Buckeye Valley’s Chloe Dawson was 41st in the Division II race to lead area athletes at Saturday’s OHSAA State Cross Country Championships in Hebron. Sprankle crossed the finish line in 18:17.8 to earn her top-10 showing. The Patriots also got steady showings from Linnea Kunesh (67th in 19:54.5) and Audrey Piero (84th in 20:09.4). Others in action in Division I included Olentangy’s Lex Brookshire, who finished 24th among individuals in 19:02.1; Olentangy Orange’s Allison Guagenti, who closed 27th in 19:05.8; and Big Walnut’s Colbi Borland, who finished 48th in 19:39.9. In D-II, Dawson led the Barons, who were making their fourth appearance in the state championship, to 12th place — the second-best team finish in school history. BV’s Bailey Kreft (66th in 20:29.1) and Chayse Arnhold (88th in 20:50) also earned spots in the top 100. Olentangy Berlin was also represented at the meet as Meghan Boggess finished 45th overall in 20:10.9. In boys’ action, Orange’s Andrew Schroff led area standouts, finishing 30th in 16:44.7. Jack Humenay led the way for Liberty, the only Delaware County squad to qualify as a team. He crossed the line 39th overall in 16:49.9. Joseph Johnson III had the Patriots’ second-best performance, finishing 86th in 17:11.8. Liberty finished 14th as a team. Like Schroff and Humenay, Olentangy’s Sam Holt also nabbed a top-50 finish, closing 45th in 16:52.1.